With Black Friday and Cyber Monday encouraging us to buy a myriad of things from shoes and cashmere sweaters to household items, I sit and wonder, do we really need all this stuff? I’ll confess, I have amassed my fair share of stuff. I am a clothes horse for sure; I love trinkets, fine china and vintage collectibles. Oh and shoes!!! Last summer, I helped my parents move which provided the impetus for a massive decluttering project. My stuff was clogging up the works! I needed to take stock. I donated bags and bags and bags of clothing, shoes, trinkets and redundant kitchen items to local charities. And boy did it feel good!! What I began to realize that life isn’t about stuff, it is about moments! Moments around food and family. As you know, it has become my life’s work to chronicle such moments. In a recent NY Times article by Kim Severson, titled “A Mother’s Cookbook Shares More than Recipes,” Kim expresses, “The worn pages of a cookbook have a unique ability to drill into a place where food memory mixes with love and loss.” Oh, how true that is. 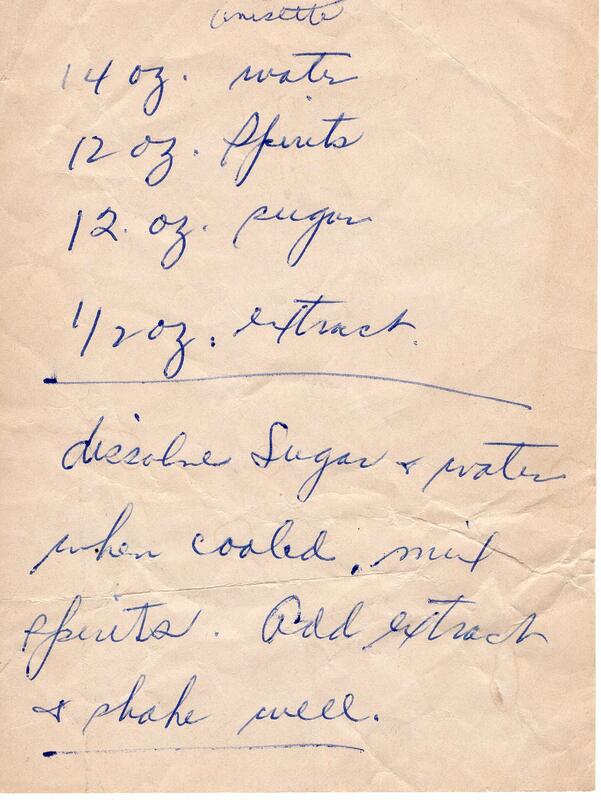 As I hold my Nana’s worn recipe notes, her handwriting alone brings me to my childhood kitchen. Who knew Nana’ recipe box and bags stuffed with magazine and newspaper clippings would become my most treasured possessions. These pages, as Kim Severson so aptly reminded me, bring me love, a pang of nostalgia and rich memories. Our memories are our heirlooms, forever. May you enter the holiday season open to turning moments into memories, especially in the kitchen. Registration for the January 11th start of the Heirloom Meals Recipe Project is OPEN!! 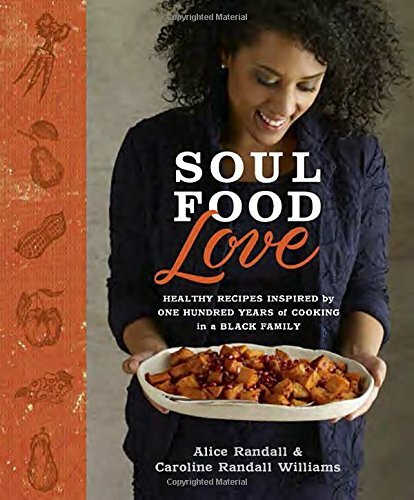 Soul Food Love honors the kitchens of four generations of black, southern women. However, the present kitchens of Alice Randall and her daughter Caroline recognize the unhealthy lifestyles that stemmed from their relatives’ calorie-laden recipes. They have chosen to stray from fat-heavy, overly-creamy dishes and lighten them while simultaneously preserving their traditional techniques. The introduction makes clear that this is not a book concept built by blaming past recipes, but rather one which chooses to honor their stories and update them to incorporate these foods to a healthier, more vibrant way of life. Randall prefaces the Warm Onion and Rosemary Salad with a description of her childhood dining table, a massive piece of furniture that sat eighteen, enough for the gatherings they would host on Sundays after church. The meals were composed of no-fuss recipes that could be served easily at room temperature. This reliance on cold mains and side dishes created a craving for the warmth of wrapping her hands around a steaming bowl, aiding her in its comfort. With only three ingredients plus a sprinkling of salt, this salad is nothing more than bringing out the flavor of a plump and gleaming onion, blistering its skin to give it a charred, smoky glory. A caramelized beauty. The Moorish Pizza combines the easy preparation of flatbread with the appeal of Mediterranean-inspired appetizers. It combines the creamy textures and familiar flavors of hummus and baba ghanoush (whose recipes the book also includes), layering them atop pita. Finish with parsley for color, some coriander and a drizzle of olive oil, and you have a dish that can be taken from starter to main, delicious, comforting, and only seemingly-indulgent. There is a section for what they call “Crowns”, dome-shaped dishes given an elaborate presentation to celebrate the cherished guests they serve. For her Cauliflower Crown, Randall reflects upon her time spent in New Orleans, where she first tried whole roasted cauliflower, mesmerized by its buttery-golden appeal. Her version omits the whipped cheese, wine, or sugar the original boasts, but with just a few tablespoons of olive oil and the earthy bite of rosemary, this is enough to satisfy a crowd. For me, thoughts of the south begin and end with Sweet Potato Pie. I know that with this comes the addition of heavy amounts of butter and sugar, but Randall relies upon the natural creaminess of the potatoes and the warmth of a few spices to create a lighter alternative. She holds onto the pecans though, because some traditions need to be retained. Brown sugar, cream, and of course butter -- these are the central ingredients which have come to define southern cooking. Randall respects this, but understands that they can sometimes be done without (or at least done with a little less). Mother and daughter know that the past is adaptable, but that the future should always contain at least half a cup. When we think of things traveling across the world, reaching every possible destination, we imagine people, ideas, or political movements, but rarely a sourdough starter. The Bread Exchange founder, Malin Elmlid, uses her book of the same title to suggest that food has just as profound, just as far-reaching effects, as all of these. She shows that anything, a story, a recipe, an experience, can be a proper trade for bread. This gives value to all of our pasts and all of our lives. Food is the great equalizer, putting us on the same level, saying that someone’s joy is not more well-deserved than another’s or that someone’s loss cannot be more devastating than your own. We each have histories to offer, our own take on bread that differentiates but connects us all. Malin’s love of bread grew from an absence of it, as she followed along with her fashion industry co-workers in refusing carbs to maintain the proper physique for their job. Throughout all of this, Malin suppressed her love of a good crust and tender interior by committing herself only to what she considered “good” bread -- well-made, with time, love, patience, and care. As she traveled for work, seeking out cities’ best bread became a passion, an obsession. But when she discovered a deficiency of it in her own city of Berlin, she got to baking herself and giving it away to friends and friends of friends, forging connections and building a network around bread. 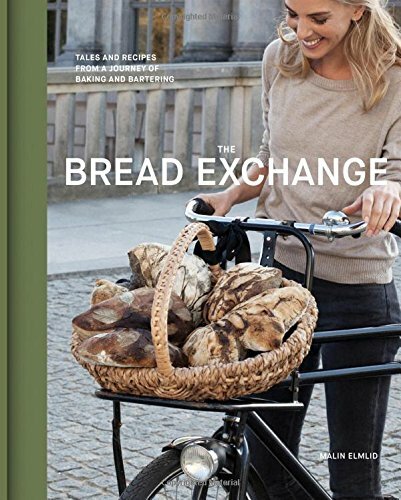 The Bread Exchange is more than a recipe book; it is a bread baker's bible, with Malin preaching that: “Good bread is nothing more than flour, water, salt and dedication. It takes time, but the joy and pride you will get from eating and serving your own bread is incredible.” Malin starts with in-depth instructions for how to make your own bread, organizing these tips under headlines like “Making a Starter”, “Fermentation”, and “Tasting”. She proceeds from here with descriptions of and the recipes from each of her trips. Her Berlin section includes a Fig Confit offered up by her friend Anna Küfner, who wanted Malin’s bread as a part of a gallery opening she was catering. She names it “the ideal accompaniment” for a strong goat cheese or a pungent blue. Stockholm features photos from a boat deck picnic spent with friends on the open, glistening water. An overflowing plate of Crayfish from Smaland dominates the center of the table. Sweetened with a little sugar and flavored by paprika, dill, and the heft of two lagers, this makes the perfect communal dish for loved ones to share. When Malin comes stateside to California, her traveling seems to take a more leisurely pace, set back in tempo by Sourdough Pancakes from a former venture capitalist, Vegan Banana Bread, and Kale Salad. Pictures of water creeping up on the beaches’ smooth sand confirms the slow-living mentality of this part of the world. Pages of photographs share the countless journeys Malin has taken, the people she has met in dozens of cities, and always a crusty loaf, boule, or unbaked dough scattered about the mix. The book ends with brief profiles of all the recipe contributors. With different approaches to greeting the camera and different gifts to share, these people, by Malin’s guidance, have created a curated cookbook like no other. It is the product of what we all have to give of ourselves; it is a gift. Just like bread. Recipes without stories are like pasta without sauce - bland, unremarkable, and generally, not memorable. 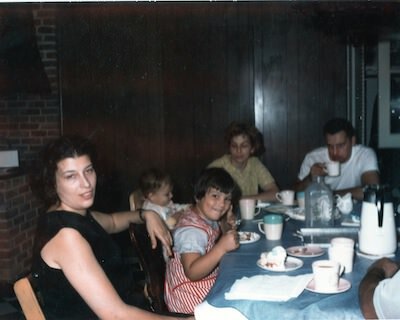 If you are like me, most of my family's recipes are special because of the memories I associate with them. They are time capsules, or triggers that take me back to a place and time. With Thanksgiving and the holiday season around the corner, I begin to crave my Nana's manicotti. (Because, you know, Italian-American's eschew turkey in favor of PASTA.) Or, perhaps, our Sweet Italian Sausage and Bread Stuffing. My stomach is growling with the thought of such delights. The smells and flavors are woven into my DNA. Just the thought of these two dishes conjures up visions of my Nana cooking, and all the holiday family gatherings of my youth. Is there anything other than food that connects us so powerfully to our roots? Such food memories ground me. They give me perspective; a sense of belonging. I belong to a clan - a family with tentacles of relatives and friends. As you know, capturing these memories has become my life’s work. The journey of collecting my family recipes and stories was emotional and healing. It allowed me to reconnect with my roots and value my life as seen through the lens of memory and food. To touch and feel the pages with my Nana’s and Mom’s writing, and put together our story through recipes and photos is an unparalleled gift that I can share with my loved ones and for posterity. I created the Heirloom Meals Recipe Project to make the journey of writing your family food narrative and collecting your recipes and photos, fun, interactive and productive. The objective of the live, 8-week “done-with-you” workshop, is to produce a gorgeous four-color hardbound book - you heirloom family cookbook - your legacy. 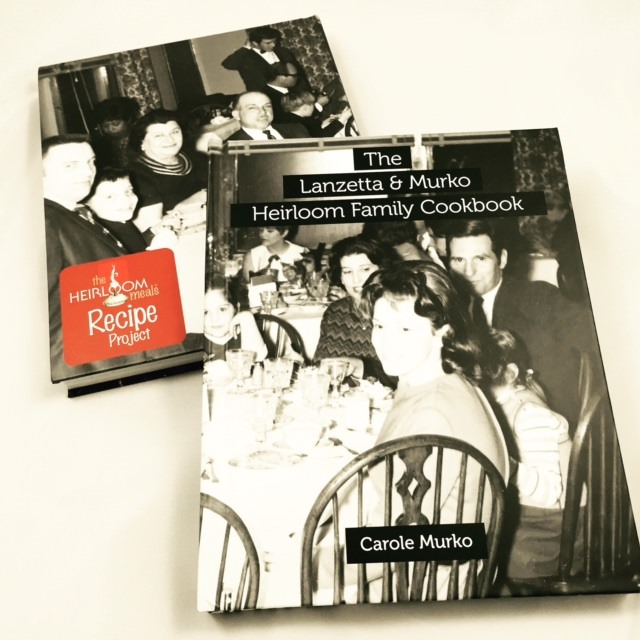 Would you like to walk down food memory lane with me and create your very own heirloom recipe book? The next workshop begins on November 24th - only a few spot left! 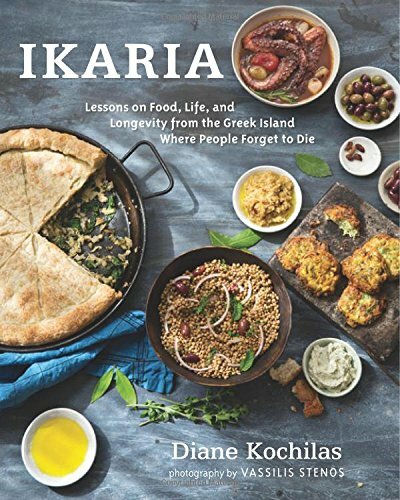 Ikaria by Diane Kochilas is not simply an assortment of recipes, but rather a well-crafted exploration and representation of an island that relies upon its local ingredients and treasured techniques to maintain an approach to living that preserves the culture that has developed there over so many years. Beginning in its “Small Bites” section, Kochilas proposes consuming an entire onion at once, a suggestion that would intimidate even the most dedicated onion lovers among us. However, her Whole Roasted Onions with Vinegar and Olive Oil trumps any aversion to this thought. Lightly coated in only a teaspoon of olive oil, slow-roasted in a hot oven for about an hour -- this is Greek-style cooking at its finest. Only a few quality, well-sourced ingredients are prepared so that their flavors are emphasized, while still allowing the onion to take the focus of interest above all else. Though the instructions give the option of preparing this in the oven, why not do as the Greeks do and roast these oversized pearls of perfection in the fireplace or on an outdoor grill? Recipes are juxtaposed with stories of the practices and ingredients native to the island. One excerpt highlights the medicinal effects of the mallows -- a plant which heals rashes and other inflammations. Another centers in on “Knowing and Loving the Old”, which discusses longevity as a result of the foods Ikarians prepare and their all-encompassing love of life. My favorite, though, is the aside dedicated to “Mushrooming in the Mountains”, which pays tribute to the 25 different types of fungi the island boasts. It shows that mushrooms, the enjoyment of both the hunt for and the eating of, are among the many curiosities of Ikaria, one of the small things that makes this a place like no other. The Mushroom Stew, which follows later in the book, uses a simple cooking method for the mushrooms, taking something infinitely complex in its varieties and adding to it only a shimmer of Greek olive oil, translucent onions, and complementary spices. This is a dish that relies upon the essential, extracting the beauty of its ingredients, and adding little else. The dessert section is small, coming only at the book’s close. The various recipes put to use the island’s natural offerings -- cherries, walnuts, apricots, peaches, figs, and takes advantage of the many different honeys available. These are displayed beautifully in tarts, cookies, and what Kochilas calls “spoon sweets” -- the mixture of many of these ingredients made into a delicious, subtle sugar syrup. We see one application of this in her Greek Jam Lattice-Top Tart, which adds to the pastry the abundance of Ikaria’s apricots in the form of jam. The outcome is slightly tart, with just a hint of sweetness. Ending the book with these little culinary indulgences says that the Ikarian diet is not only about feeding ourselves the nutrients our bodies need, but allowing ourselves to enjoy what makes us happy, what feeds our soul, and what makes us complete. The majority of food infatuations don’t begin until after adulthood has set in -- once our tastes have matured and we have defined our culinary preferences. Domenica Marchetti skipped a few steps, having spent her childhood summers in Italy, reveling in the fresh offerings of the local markets. This is where she fell in love with vegetables, each entirely unique in their varying geometric constructions and brilliantly bright hues. 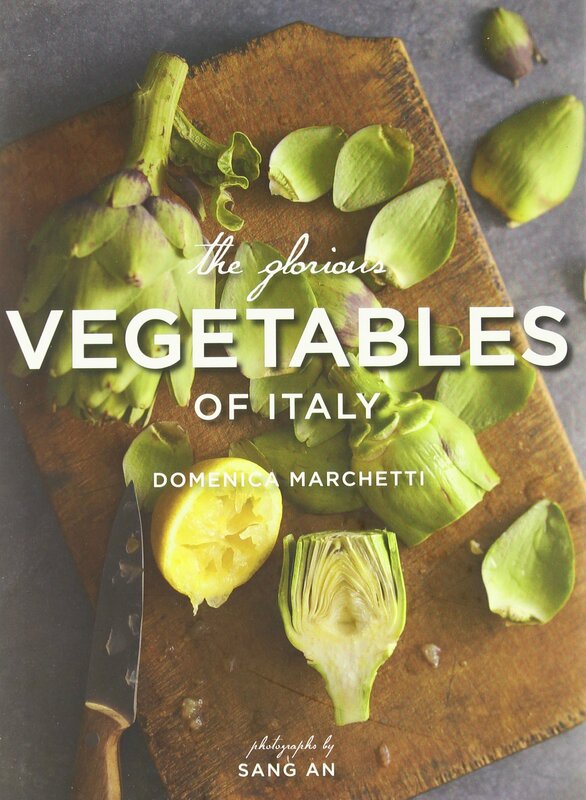 In The Glorious Vegetables of Italy, Marchetti translates this passion for her reader, wanting to show that all vegetables are worthy of our affection. Marchetti first breaks vegetables down to their roots, calling this section the “Gallery of Italian Vegetables” a name fitting of the praise and glory she gives to each. She provides information on their season, telling readers when pumpkins are at their sweetest and artichokes are at their best. She adds to this instructions for cleaning so that all vegetables will shine beautifully in her recipes. The minimalist photographs capture all that is necessary to convey the ingredients’ appeal; blistered cherry tomatoes pop out against the pale sauce in Capricci with Slow-Roasted Tomatoes and Cream while the near-white fennel atop a Pizza Bianca melts into the lightly-browned and bubbly ricotta and mozzarella. A rainbow of colors abounds in her other flatbreads, providing options like Grilled Eggplant in Olive Oil or Grilled Peppers, completed and contrasted with a handful of the greens of your choice. Marchetti’s creativity gets put on display in her desserts, where she uses a Panna Cotta, made creamy and luscious by heavy cream, sugar, and mascarpone to give attention to the sweetness of a roasted winter squash. This recipe gives the essence of what Marchetti wants to make known: by starting with quality ingredients and cooking them only so that their natural flavors come through, you bring vegetables back into the spotlight, allowing them to be savoured and treasured in every bite. Andiamo in giardino. Let’s go into the garden.